I’m pleased to announce that my friend and co-worker Joseph Calev has decided to share his trip report to Uzbekistan and Tajikistan with us. You can see more of Joe’s work at http://calevphoto.com/ and on Flickr. We travelled to Uzbekistan and Tajikistan in Central Asia. In Uzbekistan we flew into Tashkent, spent a day there, then headed to Samarkand for a few days. From Samarkand we traveled north to visit the fortress at Navoi from Alexander the Great, then further north to stay at a yurt by Lake Aidarkul near the Kazakh border. We then traveled back down to Bukhara, where we stayed for several days, then drove on further to Khiva. From Khiva we drove to Urgench and took a flight back to Tashkent. From there we spent a day hiking the mountains in Chimgan on the Kyrgyz border and then drove to Khujand in Tajikistan. We visited with friends in Khujand and then drove back to Tashkent and came home. I liked everything except for Tashkent. My favorite was probably Lake Aidarkul. There we no hotels around this huge lake and it was crystal clear blue and very warm. There was a gentle slope in the water so we just relaxed with literally no one for miles and watched sussliki on the shore and colorful birds fly overhead. 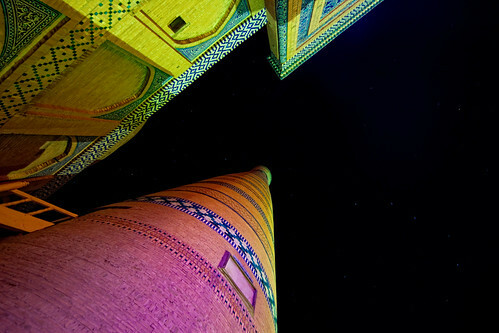 At night there were tons of stars and they sang traditional Uzbek songs. Tashkent was a very strange city. It has tons of huge buildings and parks in the center but there is almost no one there. In the park next to our hotel there were several cleaning people waiting for something to get dirty, but I never saw more than ten people in the park at a time. Tashkent also has a somewhat Soviet mentality and had a number or ridiculous rules. Tashkent did have some nice historical structures that are interesting as long as you see them first (because the rest of Uzbekistan blows it away). Samarkand has the Registan and the tomb of Amir Timur - two of the more impressive buildings I have seen. It also has a section that looks straight out of Aladdin and the ruined ancient city on the periphery where you can still see bones sticking out of the dirt from soldiers who died during the Mongol invasion. The city is rather built up so between the structures it is not so interesting as most of the old city was destroyed. However the buildings still standing are very impressive. 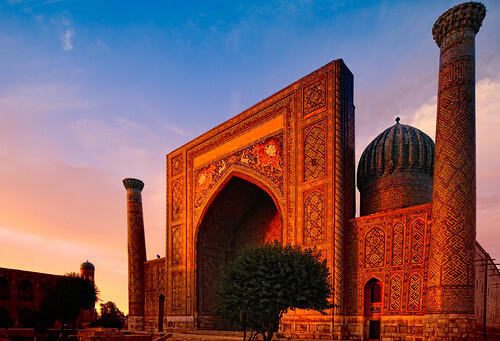 Samarkand was the capital of Timur’s empire and is where he is buried. [My kids] got a kick out of the ancient city of Samarkand where you can see the bones of soldiers who died in the Mongol invasion sticking out of the dirt. 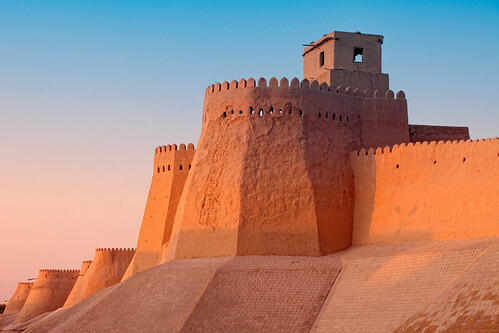 Khiva is simply amazing and was the capital of the Khorezm Khanate. It is magnificently preserved and within the city walls you feel you are back in time. 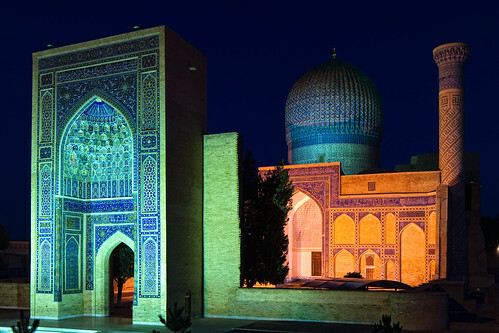 Many of the structures are not as old as Bukhara and Samarkand but they are very beautiful. Khiva was my wife's favorite place and its sad many tourists to Uzbekistan do not get there as it is a bit tricky to get to right now. The road from Bukhara took ten hours and was extremely bumpy – being a one lane road with tons of pot holes. Chimgan was very beautiful and I really wore myself out hiking there. I found a lot of interesting insects to photograph there and the mountain scenery is also very nice. It is also much cooler there (temperatures were over 100 during the middle of the day everywhere else). I did not see the highlights of Tajikistan but I can say the people are extremely friendly. Tajikistan has none of the border problems found in Uzbekistan and people there are more relaxed. It is a very poor country though so the facilities are not as good. We did not have air conditioning, water for showers ran out in two minutes, the water smelled horrible, and occasionally we lost electricity for a few hours. I would like to return to Tajikistan someday to see the Fann Mountains and the Pamirs. As I mentioned, Tashkent is very Soviet like and the bureaucracy there can be ridiculous. The other issue was Uzbekistan customs. We were aware of the issues ahead of time and made sure to declare all of our money and camera equipment. If you do not declare these, when leaving the country they will be confiscated. They did have me open my wallet and count my money, then searched my bags for more, to verify the amount I wrote was correct. They also did go through my camera equipment and asked to see my photos (though ironically only on my son's G11) to make sure the photos did not portray Uzbekistan in an improper light (which is illegal). The customs form is also a pain to fill out correctly as certain things go in certain sections. On the contrary, when we arrived in Tajikistan we went through a big building marked “customs” with a single guy standing there smiling. Upon entering he welcomed us to Tajikistan and asked if we knew any words in Tajik. I said a few words and he laughed and let us through. On the way back he asked me if I learned any more words. The biggest adventure was getting over the border from Tajikistan to Uzbekistan. The two countries are not friendly at all and there was a long line and we had a driver who had to leave by a specific time. In order to get through the crowd we convinced them that we were American diplomats. Amazingly, they bought it. Other adventures included having our car break down in the middle of the desert (twice) and getting invited to an Uzbek wedding (they saw my camera and invited me in). As my wife is from Tajikistan, we were already very familiar with the food. The national dish of Uzbekistan is plov. In English this is often called pilaf and consists of rice, carrots, garbanzo beans, and either beef or chicken. 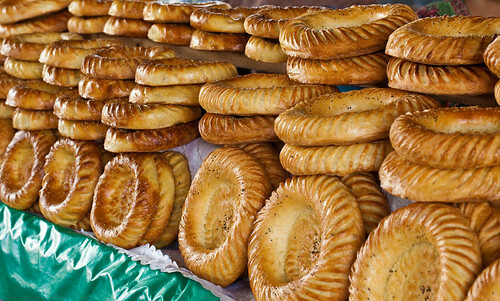 The Tajiks also consider this their national dish. Other prominent foods are shish-kebabs (shish is “six” in their language and this is where it comes from) and mantu and sambusa – which are a form of meat filled dumpling. Of course, they do not call them “shish” kebabs there but instead have many different names depending on the meat and style. Pretty much every dish contains some type of meat and these are not good countries for vegetarians. In Uzbekistan, the money is quite comical. The official rate is 1,700 sums to the dollar, but in the black market you can get 2,400. The problem is the largest bill is 1,000 sums. No one accepts credit cards and restaurants do not accept dollars (when you buy souvenirs you can use dollars though) so I always had to carry a huge wad of sums around. The stack overwhelmed my wallet so I had to dedicate a pocket just to sums. 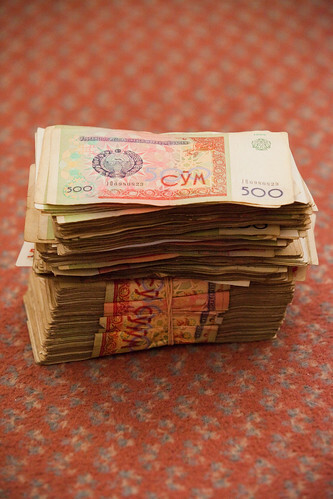 In Tajikistan the money is more normal. Uzbekistan had some odd policies. For instance at the hotel they had a cooler with water in it. My wife filled a cup with it and was reprimanded that the water is only for visiting athletes. When we visited a water park in Tashkent, the tickets are only good for three hours. The park contains a number of restaurants, but you are not allowed back in the park fully clothed to eat at any of them. As I mentioned Tashkent is a very strange city. Imagine that you took all of the main government and artistic buildings (opera, performing arts center, theater) and put them in one place. Each one is a huge grand building and between them are huge parks with large monuments. Then imagine no one went there. That is kind of like Tashkent – the center of town consists of huge buildings, huge parks, and no people except for a large army of cleaning people waiting for something to clean and police officers making sure everything is in order. Safety was not a concern at all. I felt very safe walking around with my equipment - often alone - in the early morning and late at night. 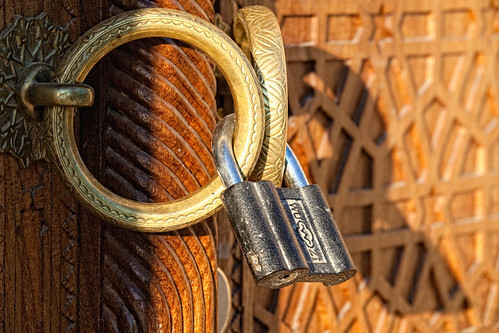 In Uzbekistan the penalties for stealing are very severe. Tajikistan was slightly more dangerous, though I was always with locals there. I was a bit worried about reports that there were many things that you cannot photograph there, but the truth is only the borders, airport, rail station, and metro are illegal. Everywhere else is fair game. It is also OK to photograph women there, though some would ask to not have their photo taken and we found it best to always ask. In some cases people were not OK with me taking the picture - but were OK with my wife taking it with the same camera. Photography is allowed pretty much everywhere. In many of the historical places there was a camera fee that was generally $1-$2. No one has an issue with tripods, though I didn't carry mine with me during the day - just at night and sunrise/sunset. 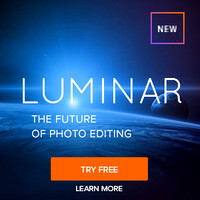 Professional cameras are rare there and you will receive some attention. Most people just want to know where you're from. Occasionally I was mistaken for a portrait photographer and people would ask me how much to take their photo. I brought with me a Canon 5D Mark II and 7D bodies, and for lenses a 70-200mm f/2.8L IS II USM, TS-E 24 II, TS-E 17, 100mm macro, 16-35mm f/2.8, and 50mm f/1.4. I used all of the lenses, though my 70-200/2.8 and TS-E 24 were by far the most used. I used the 100mm macro for market shots and the TS-E 17 for some of the interiors. The ceiling shot was taken with my 16-35. I hope you enjoyed Joe’s trip report. If you want to learn more, visit part II of his report here. Please use the comments to let me know if you’d like to see more articles like this and/or have your own to share. 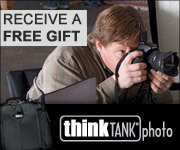 I may get a commission if you make a purchase using selected links in this article. Assalamu alaikum..... Posting yang bermanfaat.